• 300 Pounds Of Remarkable Ability: Ben Ancheff nearly dies at birth but becomes 7-time all-state athlete in football, baseball, wrestling. 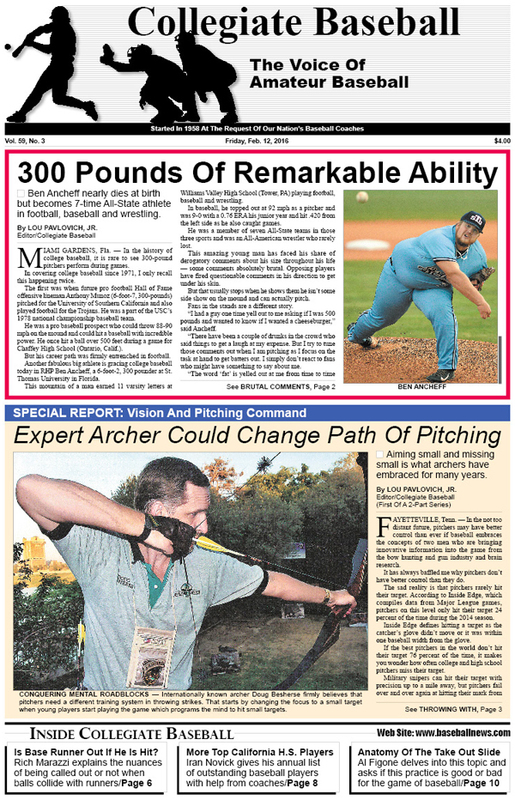 • Vision, Pitching Command: Expert archer has a system that could change path of pitching. • Editorial: Huge rise in ejections can be slowed easily. • John Herbold Column: Disciplining players will always start arguments with coaches. • Ruleball With Rich Marazzi: Is the runner always out when he is struck by a batted ball? • Jack Dunn Column: Ball game sponsor program is easy way to raise money for teams. • Special Report By Jim Meier: Baseball personality profile can help teams thrive mentally. • More Optimal Experiences In Baseball: Peak performance strategies studied by experts. • Commentary by Geoff Zahn: Will to win absolutely essential for successful pitchers on mound. • Mike Epstein Column: Overcoaching with hitting can be a massive problem in baseball. • Special Report: Peter Fadde gives in-depth analysis of how pitch recognition can be achieved. • Role Of The Coach: Justin Dehmer explains what precisely a skipper should do in his important role. • Maintaining Focus On College Search: Tom Kovic presents 5 simple tips that will help athletes in the tactical quest to find a school. • Other Top High School Players From California: Iran Novick presents his annual list of remarkable athletes from this baseball-rich state. • Wins 10th Power Showcase: Justin Farmer of Riverview H.S. (Fla.) captures this prestigious event. • Special Report: Al Figone gives an in-depth look at the anatomy of the take out slide and why it is dangerous. • College Notes: San Jacinto College (Tex.) pitchers Montana Parsons and Colten Schmidt fire perfect game and no-hitter over first weekend of baseball season. To purchase the Feb. 12, 2016 edition of Collegiate Baseball or subscribe, CLICK HERE.